For calculating your horoscope we used the astrology of your zodiac sign Taurus, your lucky number which you did not enter, the today's date and the numerology of your first name. The result we combined with the right fortune Tarot card, the misunderstanding. A day full of misfortunes waiting for you. Your stubbornness and the fact that you are so enthusiastically by your own opinion will cause you problems. Try to avoid confrontations with friends, even if you think that you are right. You will definitely lose out on it today. A day of misunderstandings, errors and intransigence is waiting for you. Situations and people will get judged wrong by you, but this mistake you will not admit. If you do not quickly stop your stubborn thinking, you will jeopardize your working place. The person, you are keeping an eye on is not the right partner for you. Although you may feel strongly attracted to him, but you do not know him well and his character is maybe not good. If it's just a romance, a flirt, then it is maybe good for you. But if you want to start a partnership with real feelings and love, then you may get hurt. The misunderstanding represents your stubbornness, that you are too much self-assured and also convinced by yourself and by your opinion, that you can not admit an error. 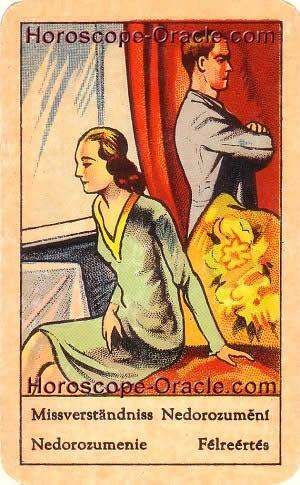 This card also represents relationship problems, it stands for a separation in love or at work.